The girls in red took their show on the road yesterday up to St. Hilda’s. They came away victorious again. 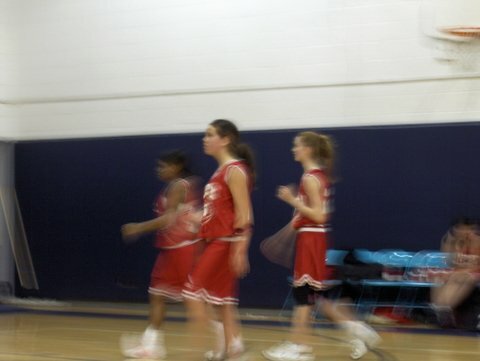 Jess scored 21, 14 of them from the line. Gloria and KK (shown with Jess in this blurry photo) scored a bunch too. It was a great team effort again. I was in Boston on Thursday afternoon and night. I snapped this photo from the 35th Floor of a building near the Prudential Center. 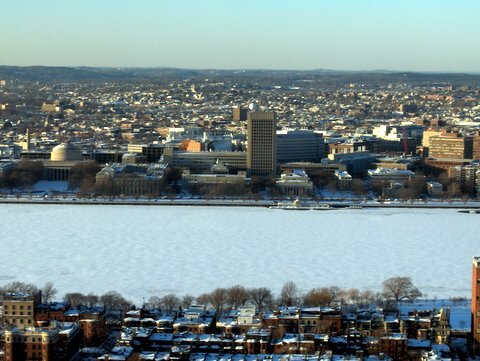 The bottom part of the photo is the Back Bay, my favorite neighborhood in Boston. The upper part of the photo is MIT, where I went to college. 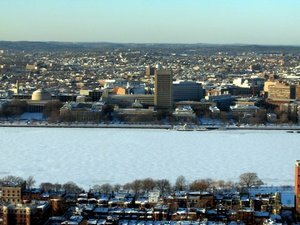 And between them is the frozen Charles river, which we used to walk across to get to school. Looking back at that time I wonder what the hell we were thinking. I like the feedburner feed best and promote it on my blog because I get stats on that feed. I have about 650 people subscribing to that feed according to Feedburner. But I have no idea how many people subscribe to the other feeds. Who knows if that is right? So, what I need (my feed need) is some way to aggregate all the feeds into a single pipe and get stats on all of them together. I have noticed that many other blogs have this same problem of multiple feeds. Back in October, I brogged (bragging on a blog – a phrase coined by Brad Feld who has been known to engage in the practice from time to time) about our portfolio company Gurunet’s public offering. Well Gurunet (GRU) hasn’t been standing still with its cash and public currency. This week two things happened that are really exciting. First, Walt Mossberg wrote an absolutely rave review of Gurunet’s Answers.com service. Go read it here. Second, Search Engine Watch reported that Google is now using Answers.com as its dictionary service. If you type in Abraham Lincoln into Google, you’ll see on the upper right of the return page a small link that says "definition". If you click on that, you go to Answers.com for a detailed description of Abraham Lincoln. Try it. All of this bodes well for Gurunet as it moves from a niche service to a mass service. Go read Tom Watson’s lessons learned from his first year of blogging. More and more people ask me why I blog these days. I am going to print out Tom’s post and read it verbatim to them. If you look at the traffic graph on the lower right hand column of this blog, you’ll see that the montly traffic to this blog peaked in October and has been in decline since. I think I may turn the monthly decline around this month, but I doubt I’ll reach the levels of traffic I got in October and November for another month or two. Jackson talks about this in his recent blog post, called "where have all the comments gone". I see this trend in the popular blogs as well. I believe this is the monthly traffic graph for Jeff Jarvis’ Buzzmachine. At least I got it from his sitemeter tag on his page. Before Jeff squawks too loudly, I should point out that if this is his traffic page, it doesn’t count his largest form of traffic which is RSS and it is probably true that his overall traffic numbers have been rising, not falling. But that also may be part of the answer to Ted’s question. I think the blogs got a huge boost from the political season and that brought a lot of people to the blog world that aren’t bloggers themselves and aren’t super technical. Those readers may be gone, for now, and we may be back to the bloggers and geeks that have made up the blog world for the past five years. If that’s the case, then the percentage of overall traffic that comes from RSS will be higher now than it was in the fall. The traffic declines represent the loss of one form of audience, but other forms may still be rising. Commenting (which requires visiting the web page itself) may be in decline as well as a result. The Gotham Gal sits on boards too. Mostly non-profit boards. Although she has been on a few for profit boards too. She has a really great post up on the joys and frustrations of the non profit world. Last night I was talking to her about a meeting she had recently had with the person who runs one of her non-profits. The conversation was about hiring and firing people. Joanne (aka The Gotham Gal) made the point that you must take a very critical view of the people on your team that you have questions about. That comment brought me back to the "buy, sell, hold" conversation I just blogged. I think the same rule can be applied to people on your team. If, knowing what you now know about them, you would not hire them, then you must move them out. Hold is also a bad strategy with people you’ve got questions about. At a board meeting not too long ago, we were discussing whether to sell an asset of the Company. A discussion ensued about the merits of the deal and we got to the issue of price. One board member made a comment that I generally agree with, he said "well if we wouldn’t buy it for that price, we should sell it at that price". That’s a piece of financial wisdom that was imparted to me many years ago and I have tried to use every time I am faced with a selling decision. The act of selling is hard for me. I like what I own (or why else would I own it) and selling something you like is hard. But you must sell to make money. I always think of the classic Bernard Baruch line. 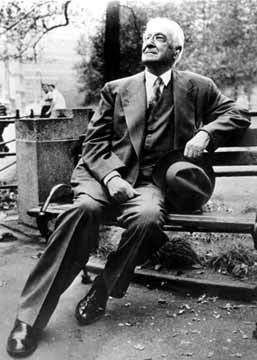 When asked how he became so rich, Baruch replied "by selling too soon". So the rigor of asking myself if I would buy something at that price is a good one. If the risk/reward is too high to buy, then you ought to sell. Back to the board meeting. Another board member whose opinions I respect disagreed immediately. He said, "there are a broad range of situations where hold is the appropriate course of action". Hmm. That sounds right too. Particularly when the transaction costs are high and buying and selling are hard or expensive or impractical (like personal real estate). So I’ll agree with both board members. In general, I like to apply the "sell when you wouldn’t buy" rule. Hold is a bad decision unless you can clearly articulate why the costs of selling are larger than the risks of not selling. I wasn’t sure whether I should have titled this Exploding TV (continued) or Sell Side Advertising (continued), but it doesn’t really matter. All of this stuff is converging anyway. Seth Godin has a must read post on how BitTorrent and TV commercials come together. I’ve always been a fan of the cliché. They summarize situations so well. Like my “hit by a bus” post. I started out in the VC business working for two guys, Milt Pappas and Bliss McCrum, who had been in the venture business for close to 20 years when I joined them. They had developed a ton of experience and Bliss, in particular, had a tendency to summarize that experience with clichés. I always loved it when Bliss would say something like “that dog won’t hunt” after meeting with a management team. He could have said, “I don’t see how that deal is going to work”, or “I think we should pass on the deal”, but “that dog won’t hunt” was always more colorful and more fun. I’ve added a bunch more clichés to my repertoire over the years and I intend to lay one on you each week. I’ll start out with one of Bliss’ favorites – Hope is not a strategy. There is always an element of optimism in every venture deal. But often times the optimism gets in the way of critical thinking. I remember attending a board meeting with Bliss early in my career and the CEO presented the sales pipeline. There were a ton of deals on the pipeline that were going to close within the next quarter. But the company was running out of cash. The CEO was confident the sales would close and everything would be fine. Bliss asked him, “what happens if we don’t close the deals?” The CEO didn’t have an answer. He simply hadn’t considered that possibility. Out came the cliché. Bliss said, “well hope is not a strategy and I suggest you get one, and quick.” That company developed a plan B which came in handy when the sales didn’t come in and we salvaged the deal and got our money back. So when developing your business plan, don’t be too optimistic, think about the downside, and develop a strategy for dealing with it.